Whether you’re a small mom-and-pop shop or an emerging small business that’s eager to expand into new markets, you likely already know how important marketing is to the success of your business. To ensure that your business continues to grow, you have to continually work to find new leads, establish new relationships, and seek out new opportunities. All of this takes time, money, and effort, and sometimes doesn’t even pay off. Trade shows offer a great opportunity to put your product and services in front of an eager audience with real buying power, but it’s important to make the most of the event. Learn how in today’s blog, below. 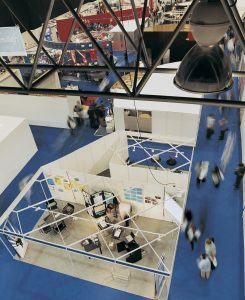 Trade shows can help you reach new markets. Before you sign up for a trade show, it’s important to determine your goals. Are you looking to expand your marketing list? Increase exposure of your brand? Meet new clients and investors? Once your have determined what you want to get out of the experience, you’ll be better equipped to make the next big trade show decision: choosing the right event. No matter what market you are in, chances are high that there are a number of trade shows every year that might be relevant to your industry. Because trade shows require such a large investment of time and resources, it’s important to choose the right event that aligns with your company’s goals. When choosing which trade shows to participate in, it helps to do your research first. Find out how relevant the event is to your industry and determine whether the audience it attracts aligns with your business goals. Once you’ve determined your goals and which event is best suited for your business, you’ll need to make the most of the event. By outsourcing your logistics to an experienced 3PL provider like AFP Expo, you can trust that you’ll be poised for success. You have more important things to worry about than whether your trade show exhibit will arrive on time. By trusting your logistics to the pros at AFP Expo, you’ll have more time to focus on making the connections that will benefit your business. For a customized logistics handling experience that places your needs above all else, AFP Global Logistics is the best and only choice! Our AFP Expo division is specifically designed with your trade show needs in mind. For more information or to start designing your own logistic solutions today, get in touch with AFP Expo at 410.590.1234 (toll-free 800.274.9452), email us at info@afplus.com, or fill out our quick and easy contact form here! This entry was posted on Thursday, November 17th, 2016	at 10:05 am	and is filed under AFP Expo	. You can follow any responses to this entry through the RSS 2.0	feed. Both comments and pings are currently closed.